I’m still hugging my family extra tight. I’m still extra-conscious about how much noise I’m making while walking. I’m still on edge anytime there’s a loud noise. And it’s been four days since I saw A Quiet Place. Don’t worry. The first part of this review is spoiler-free. I’ll warn you when they’re coming. Quietly. What few jump-scares are present are well-earned payoffs, not hack-y surprises used for a cheap jolt. The gore is almost nonexistent, with two memorable (and necessary) exceptions. And I don’t think there was a single second of that film that wasn’t absolutely critical to setting up another story beat later in the film, all culminating with an ending that earns its payoff. 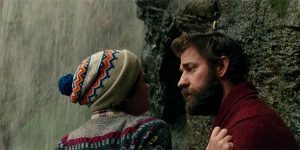 As Krasinski notes, the true drama in the film comes from the family drama; the drama of parents who need to protect their kids, and kids that are frantically trying to live a normal life in a world that’s anything but normal. The child actors, too, are well-chosen, well-directed, and well-defined. 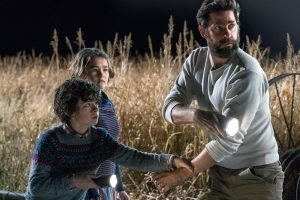 They’re very complete characters, both in the script and as portrayed; Noah Jupe and Cade Woodward, of course, but especially Millicent Simmonds, who plays Krasinski and Blunt’s oldest daughter. A deaf actress herself, she brings a depth to the performance of a deaf character that I don’t think a hearing actress could’ve provided; but even more, she provided an invaluable service to the production by guiding them in their sign language to seem more fluent. Those who are fluent in ASL note that Krasinski’s signing was stern, Blunt’s was elegant, Jupe’s was laconic, and Simmonds’ herself was sassy, providing a way to characterize their “speech” and their personalities, even though there are only a handful of spoken lines in the film. And that lack of speaking is, of course, something that needs to be addressed: in a film without much spoken dialogue, the sound that is present must be pristine. 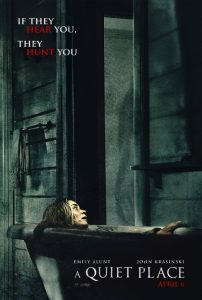 In A Quiet Place, it is. It doesn’t seem like a gimmick; the incidental sound and intentional sound treatment, the careful and minimal use of music, and the almost tangible foley work are all hard at work setting a great mood of mystique, dread, and suspense that stretches tighter and tighter like a string, plucked at every moment of sheer terror. It’s not a perfect movie—a moment near the beginning is quite intense, and nearly turned me off the film; the linear nature of the plot doesn’t allow for much complexity (not that it’s needed in this case); and while the writing and directing is good and even great at points, it’s nothing to write home about—but it’s a good movie. Maybe even a great one. I enjoyed it, but more than that, I was affected by it. Profoundly so. Shh! There are spoilers from here on out. Leave quietly or risk being attacked by one. I think it’s the fact that I was so affected by the film that has made it stand out in my mind (and the minds of so many critics). Its premise, plot, themes, characters, sound, lack of dialogue, and earned suspense all swirled together to make me think about it quite a lot. As a father, the opening scene (featuring Cade Woodward’s character’s tragic death) was very affecting for me. As I noted above, it nearly turned me off the film, and I’m sure that it was just as tough for Krasinski to create as it was for me to watch; when he read the script, he was “a wide-open vessel of tension, fear, and all the other things that new parents go through.” But it was also so necessary; it established the danger with punch, increased the suspense to a dread, and created the emotional weight that would follow each other member of the family to the end of the film. Still, I couldn’t help placing my own son (who is only a little bit younger than the child in the film) in that place. He wouldn’t know any better. He just wanted to play with the rocket. And that simple desire is part of what makes it so tragic. Nothing they want is evil, but if they don’t pursue those desires in complete silence, they will die. And nobody can be perfectly silent all the time. The greatest sin in A Quiet Place is to make a sound. Into that world comes John Krasinski’s character, whom we only learn in the credits is named Lee Abbott. He’s a remarkable Christ figure in this film, because the sounds he makes in a silent world bring life instead of death: first to his son Marcus at the waterfall, shouting to bring life out of the death of fear; second to his wife Evelyn in the bunker, speaking quiet words to bring life out of the death of her remorse; and third to Marcus and his older sister Regan, yelling defiantly to draw the attention of the monster so they can escape. And his messianic echo isn’t merely in saving the children from a certain death in that moment. The device he’s created for his deaf daughter, they’re shocked to discover, is able to turn aside the monsters’ attention and even disable it. It’s the ability they need to stay alive; a comfort and guide whose existence leads to the one minute I found completely different from the other 94 minutes of the film. In the last minute, after discovering that her cochlear implant has the ability to disable the monsters, Regan turns up the volume on the radio and prepares to play the sound as loudly as she can. She and Evelyn see two monsters approaching the house on the video monitors, and Evelyn grins with confidence as she reloads the shotgun. It’s a remarkable minute of release and achievement that made me audibly gasp in the theater; the Abbott family is finally on top. After years of being oppressed by the fear of the monsters, they finally have power to overcome them; like a technological, high-pitched Holy Spirit, the sound of the hearing aid in their silent world gives them life. The suspense and triumph of this minute, over the oppressive suspense and dread of the previous ninety-four—it’s affected me ever since. This article was originally posted on Reel World Theology. This entry was posted in Suspense and tagged A Quiet Place, horror, John Krasinski, parenting, Reel World Theology, suspense. Bookmark the permalink.